In super condition cosmetically and mechanically, ask for more details. 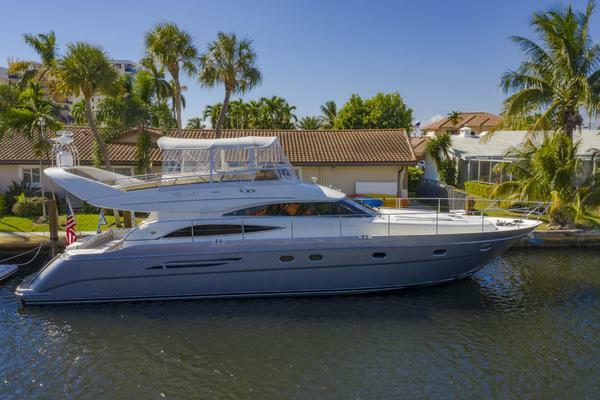 United Yacht Sales New Jersey would love to guide you through a personal showing of this 72' Burger Flybridge (cpmy) 1961. 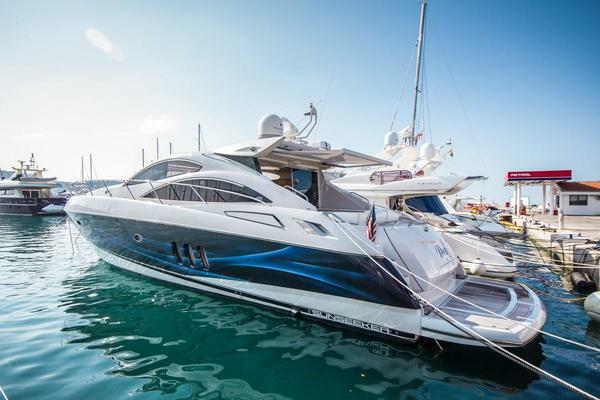 This yacht for sale is located in Unknown United States and priced at $460,000. For a showing please contact us by filling out the form on this page and we will get back to you shortly! PATRIOTsleeps 6 in three double staterooms aft, plus crew quarters forward for 2 and 3 heads. The interior of PATRIOT was completely redone between 1993-2000 and new woodwork, partition bulkheads, passage doors, soles, and headliners renewed. A combination of Honduras mahogany, birdseye maple, black lacquered highlights, and a teak and holly sole were utilized to create an elegant effect. A complete list of the last refit available. Aft Deck The air conditioned AFT DECK is fully enclosed on four sides, with tinted windows all around. There are port and starboard wing doors leading to the outside walkways forward, while a center door in the aft bulkhead leads to steps down to the cockpit. The doorway entrance to the pilothouse forward is slightly offset to starboard. There is a teak deck in the aft salon and looks like new. There is teak wainscoting, with teak cabinets built into the aft starboard corner to enclose the wet bar, fridge, ice maker, television, and entertainment center. Built into the aft port corner is a leather upholstered banquette which runs forward nearly to the wing door. Two swivel chairs are opposite to starboard, with a table between them. A wood and beveled glass cocktail table sits in front of the banquette. Cockpit There are built-in bench seats to either side of the center stairway from the aft salon. A deck hatch in the middle of the cockpit provides access to the storage lazarette, which also houses the engine starting batteries as well as enabling service to the rudder assemblies and trim tab reservoir. Lower Salon Forward and up three steps to the LOWER SALON AREA, features a broad expanse of teak and holly flooring and natural finished Honduran mahogany woodwork. The bulkhead veneers are sequence matched, with crafted solid trim detail and companion window valances. The salon has been opened up to the galley area forward with a low, pillared railing, painted in gloss black. There is salon seating to port and starboard, including an Orientalstyledthree-doorcredenza positioned against the aft bulkhead. Adding further to the Oriental flavor, are two ceramic urns topped with lighting fixtures. A white leather sofa is positioned to port, with two matching occasional chairs to starboard, a black lacquered hutch between them. A glasstopped black lacquered cocktail table in the center, atopan Orientalrug. Across the forward trunk section of the salon are three,nautical portlights, original to the yacht. Master Stateroom The MASTER STATEROOM is all the way aft, with a centerline queen berth, built-in cabinets, vanity, and many drawers. The head is an Ensuite head with Corian counter and integral sink, decorator fixtures, and Corian shower enclosure. There are two cedar lined hanging lockers, plus a recessed area for television, stereo controls, and telephone. The joiner work in the master stateroom is expertly done, pickled birdseye maple with double roundover moldings and curved wall panels. The soles are clear maple planks with a durable, pickled finish. Guest Staterooms The woodwork forward of the master stateroom is natural tone Honduran mahogany, with teak and holly soles. There are two GUEST STATEROOMS just forward of the master, which share a head with stall shower. The PORT GUEST STATEROOM has twin lower berths. Opposite to starboard is the SECOND GUEST STATEROOM with upper and lower berths. Forward and up three steps to the LOWER SALON AREA, features a broad expanse of teak and holly flooring and natural finished Honduran mahogany woodwork. The bulkhead veneers are sequence matched, complimented by crafted solid trim detail and companion window valances. The salon has been opened up to the galley area forward by removing the original partition enclosure and replacing it with a low, pillared railing, painted in gloss black with gold highlights. There is salon seating to port and starboard, including an Oriental styledthree-door credenza positioned against the aft bulkhead. Adding further to the Oriental flavor, are two ceramic urns topped with lighting fixtures. A white leather sofa is positioned to port, with two matching occasional chairs to starboard, a black lacquered hutch between them. A glass topped, black lacquered cocktail table in the center, atop an Oriental rug.The two opening salon windows to port and starboard, have been removed and replaced with fixed, non-leaking frames and windows. Across the forward trunk section of the salon are three, nautical looking portlights, original to the yacht. Galley The GALLEY is forward and down four steps from the main salon. The ENGINE ROOM access is from the Galley by way of a walk down stairway on the port side, with the machinery space below the lower salon deck. The salon deck has removable hatches as well, for service requiring full headroom..The salon deck has removable hatches as well, for service requiring full headroom. Crew Forward of the galley to the CREW STATEROOM with upper & lower berths and a private head with separate stall shower. The washer and dryer are built-in and enclosed, opposite the crew berths. The mahogany paneling and doors extend into the crew area, as does the teak and holly sole. The joiner work in the master stateroom ispickled birdseye maple with double round over moldings and curved wall panels. The soles are clear maple planks with a durable, pickled finish.